The fast-moving wildfire burning in the Cleveland National Forest in Orange and Riverside counties has burgeoned to 18,137 acres and is still only 5 percent contained Friday. More than 1,200 firefighters battled the Holy Fire, which continued to spread to the east toward Lake Elsinore and north into Cold Water Canyon and Santiago Peak, prompting the evacuation of more than 7,400 homes and structures and 21,484 people, according to the U.S. Forest Service. On Thursday, the size of the fire had been listed at 10,236 acres and the containment was listed at 5 percent. On Thursday afternoon, the flames raced downhill toward Lake Elsinore, threatening homes and prompting mandatory evacuation orders from homes fronting the mountains. “It just hurts knowing that everything we’ve done here, all the memories, might be washed away with just, with the blink of an eye,” Sam Penueles told NBC4 as she and her parents prepared to evacuate their Lake Elsinore home. All schools in the Lake Elsinore Unified, Menifee Unified, Perris Union High School and Perris Elementary School districts in Riverside County will be closed Friday due to poor air quality caused by the fire. Governor Jerry Brown declared a state of emergency for Orange and Riverside counties Thursday due to the effects of the Holy Fire, allowing the state Office of Emergency Services to provide assistance to the counties. 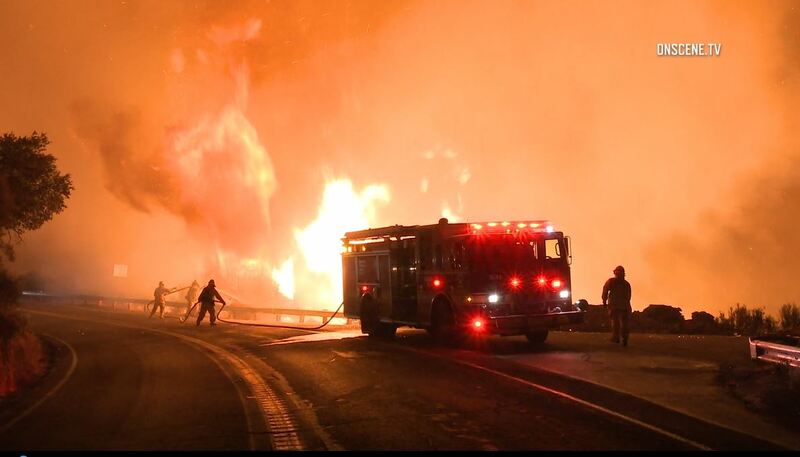 The proclamation also waives various requirements for state agencies to procure materials, goods and services to assist with the response and recovery from the impacts of the fire, suspends the one-week waiting period to apply for unemployment benefits for people who have lost their jobs because of the fire, allows people who have lost their driver’s license, vehicle registration certificate or certificate of title for their vehicles because of the fire to get free replacements and to get free replacements of birth, death, marriage and divorce certificates destroyed by the fire. Brown’s declaration came hours after Forrest Gordon Clark was charged Thursday with aggravated arson damaging at least five inhabited structures, arson of inhabited property, arson of forest and criminal threats, all felonies, as well as two misdemeanor counts of resisting arrest, according to Assistant District Attorney Chris Duff. The 51-year-old Clark could face 10 years to life in prison. He also faces sentencing enhancements for arson of multiple structures. “As far as exactly how it was started, we’re still working through some of that evidence,” Sherwood said. Since it erupted Monday afternoon, the blaze has destroyed a dozen cabins in the Holy Jim Canyon area of the Cleveland National Forest and advanced into Riverside County. While the blaze has continued its unrelenting march, U.S. Forest Service officials said Thursday they “expect favorable weather conditions this weekend” to help the firefighting effort. The South Coast Air Quality Management District issued a smoke advisory effective through Friday in Orange County and portions of Los Angeles, Riverside and San Bernardino counties because of the Holy fire. In Los Angeles, the advisory covers the east and south San Gabriel Valley and Pomona/Walnut Valley. Two firefighters were treated for heat-related injuries Monday. A U.S. Forest Service spokesman said more than a dozen cabins in Clark’s neighborhood had burned. Clark’s cabin, however, was not damaged by the fire, the Orange County Register reported. The phone numbers for residents to call for information on the Holy Fire have changed, according to CalFire. The new numbers are (714) 573-6200 and (714) 573-6202.